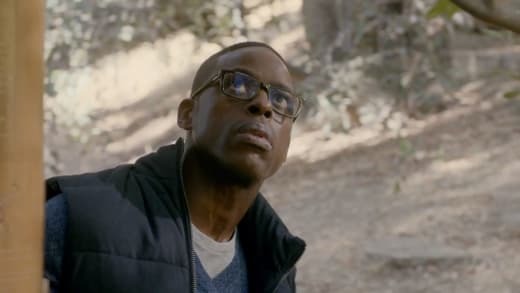 Yes, it looks like we're about to head into another heartbreaker with This Is Us Season 1 Episode 9, "The Trip." Olivia speaks a harsh truth to Kate, which drives a wedge between Kate and Kevin. Rebecca and Jack struggle with what to do when 9-year-old Randall tells them that he's been looking for his birth parents. We've been wondering whether or not Jack was on board with the way Rebecca handled the situation with Randall's birth father, William. Did he even know? From the preview, it seems he might not have known, and if he did, the situation might have been handled much differently. Jack knew how Randall was struggling to fill a void in his heart and wanted to do whatever he could to help his son to fill it, even if it meant finding and connecting him to his birth parents. Well, it seems like Randall is going to find himself on some sort of a vision quest at the family cabin, because he finds there, working on the roof, the one person who can weigh in and help him find peace: Jack. If you don't think the two fathers of the year aren't going to rip your heart out and tug and squeeze it while pouring salt into your eyes, think again. I was already getting a lump in my throat just seeing the look on Randall's face and hearing Jack say, "Hi son." "The Trip" is going to have it all. Randall, Kate and Kevin will share their first scenes together, and we'll even get a scene with an adult Randall and Jack? I'm getting an episode of the year trophy ready. The Golden Kleenex box. How about you?? Check out the promo and be sure to watch This Is Us online if you need to catch up before Tuesday, November 29.